Please click on the thumbnails to download the case study. 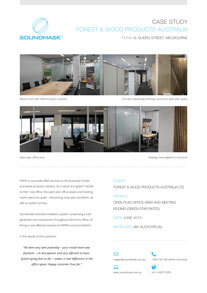 AMP Financial Services wanted to achieve a Green Star office space. This requires Green Star compliant materials and energy efficient appliances and fittings. The space, however, had noise problems: some areas were too quiet and some areas were too noisy. Also, as an insurance company, speech privacy was important. Instead of using panel and tile acoustic treatments, AMP engaged us to install a Soundmask system to good effect. Using a Soundmask zone distributor allowed the client to “zone” different spaces, customizing the level of soundmasking in each space and smoothing the overall sound quality. The Commonwealth Bank of Australia’s head office is situated in the newly developed area of Darling Walk, in the southern precinct of Darling Harbour, Sydney. 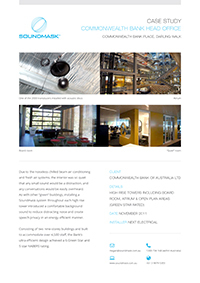 Consisting of two nine-storey buildings and built to accommodate over 4,500 staff, it conforms to the 6-star Green Energy rating standard, and the 5 Star NABERS (National Australian Built Environment Rating System) Energy rating. Its ultra-efficient design, with such features as noiseless chilled beam air conditioning and fresh air systems, meant that the interior was so quiet that any small sound would be a distraction, and any conversations would be easily overheard. As with other “green” buildings, installing a Soundmask system throughout each high rise tower introduces a comfortable background sound to reduce distracting noise and create speech privacy in an energy efficient manner. Cbus is the industry superannuation fund for the construction, building, infrastructure and allied industries and is also one of Australia’s top performing super funds. 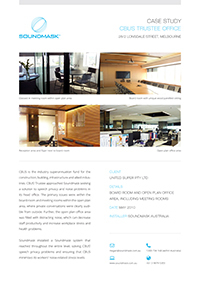 Cbus’ Trustee approached Soundmask seeking a solution to speech privacy and noise problems in its head office.The primary issues were within the board room and meeting rooms within the open plan area, where private conversations were clearly audible from outside. Further, the open plan office area was filled with distracting noise, which can decrease staff productivity and increase workplace stress and health problems. Soundmask installed a Soundmask system that reached throughout the entire level, solving Cbus’ speech privacy problems and ensuring that Cbus complies with the Model Work Health & Safety Act in respect of its workers’ noise-related stress levels. Because the air-conditioning and other services are all installed in the under floor system, there are no suspended ceilings (where a traditional system would be placed). Therefore the transducers are located under the Tasman Access floor. This floor was manufactured from steel and concrete composite, requiring powerful transducers to ensure the correct penetration of sound. This has proven extremely successful in introducing a non-intrusive background sound giving comfort and speech confidentiality, and reducing the intrusion of surrounding noise. FWPA is a provides R&D services to the Australian forest and wood products industry. 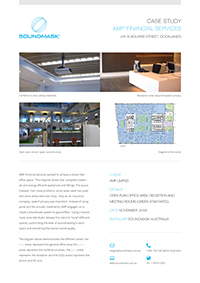 As a result of a “green” retrofit to their new office, the open plan office space and meeting rooms were too quiet – distracting noise was a problem, as well as speech privacy. 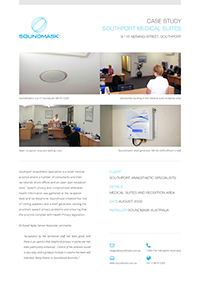 Soundmask Global installed a system comprising a rack generator and transducers throughout the entire office, offering a cost effective solution to FWPA’s sound problems. Hamilton Call Center is a government service provider located in Hamilton, Ontario. The client approached Soundmask Canada, concerned about speech privacy problems within the private offices and meeting rooms, as well as in the open concept call center area itself which doubles as a training area. The different areas required different soundmasking treatments, which called for separate zones. 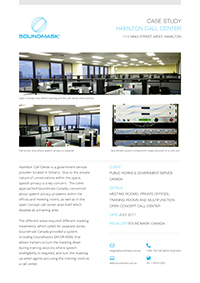 Soundmask Canada provided a system, including Soundmask’s zone distributor, that allows trainers to turn the masking down during training sessions where speech intelligibility is required, and turn the masking up when agents are using the training room as a call center. As a result, speech privacy is preserved without affecting the levels within the meeting rooms or offices, or sacrificing the multipurpose function of the open concept area. 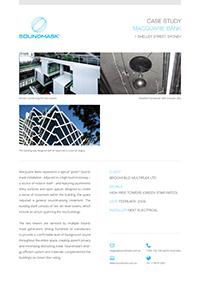 Macquarie Bank represents a typical “green” Soundmask installation. Adjacent to a high level motorway — a source of noise in itself — and featuring asymmetric shiny surfaces and open spaces designed to create a sense of movement within the building, the space required a general soundmasking treatment. The two towers are serviced by multiple Soundmask generators driving hundreds of transducers to provide a comfortable level of background sound throughout the entire space, creating speech privacy and minimising distracting noise. Soundmask’s energy efficient system and materials complemented the building’s six Green Star rating. The Sydney Opera House Box office features an open plan design with low partitions. Speech privacy was compromised and distracting noise was a problem for the workers who take bookings over the phone. The premises are within a listed heritage building, so any modifications need to conform to these requirements. 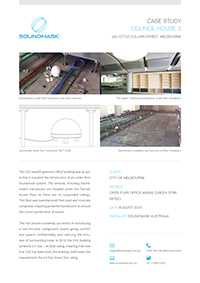 Due to the vaulted (saw tooth) ceiling structure, Soundmask needed to use an open ceiling Soundmask system using exposed transducers with acoustic discs for an even spread of sound. The transducers blended with the existing light fittings to ensure that they were visually non-intrusive. 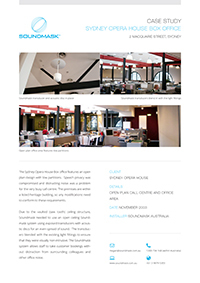 The result of the open ceiling Soundmask system was to increase the comfort zone in a very busy office and ensure that staff could take customer calls without distraction from surrounding colleagues and other office noise. Southport Anaesthetic Specialists is a small medical practice where a number of consultants and their secretaries share offices. The main concern was the open plan reception area where five secretaries share a small space with no physical barriers between them. In particular, speech privacy was compromised with health information being gathered at the reception desk and via telephone. Soundmask installed five “cut in” ceiling speakers and a shelf generator, solving the practice’s speech privacy problems and minimising distracting noise between the secretaries. 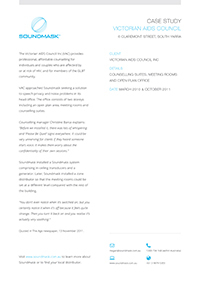 VAC approached Soundmask seeking a solution to speech privacy and noise problems in its head office. The office consists of two storeys including an open plan area, meeting rooms and counselling suites. Soundmask installed a Soundmask system comprising in-ceiling transducers and a generator. Later, Soundmask installed a zone distributor so that the meeting rooms could be set at a different level compared with the rest of the building. Weploy is a Melbourne startup with an on-demand recruitment platform. Their head office is a warehouse, retrofitted to integrate their minimalist design style. The boardroom and executive office, used to hold confidential meetings and discussions, is walled with glass and no ceilings: an aesthetically pleasing but indiscreet space. 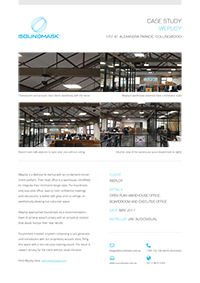 Weploy approached Soundmask via a recommendation, keen to achieve speech privacy with an acoustical solution that would honour their new retrofit. Soundmask installed a system comprising a rack generator and transducers with our proprietary acoustic discs, filling the space with a non-intrusive masking sound. The result is speech privacy for the client without visual intrusion. 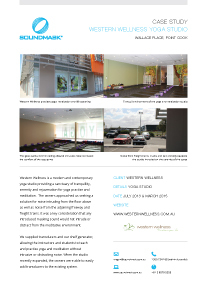 Western Wellness is a modern and contemporary yoga studio providing a sanctuary of tranquillity, serenity and rejuvenation for yoga practise and meditation. The owners approached us seeking a solution for noise intruding from the floor above as well as noise from the adjoining freeway and freight trains. It was a key consideration that any introduced masking sound would not intrude or distract from the meditative environment. We supplied transducers and our shelf generator, allowing the instructors and students to teach and practise yoga and meditation without intrusive or distracting noise. When the studio recently expanded, the owners were able to easily add transducers to the existing system.